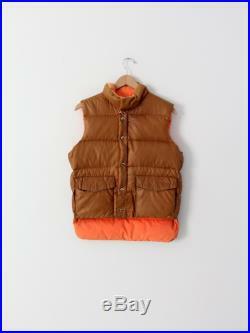 Circa 1970sa vintage spacecraft men's puff vest. 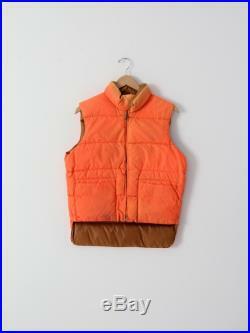 The orange and tan vest is fully reversible with pockets and snap closure on both sides. 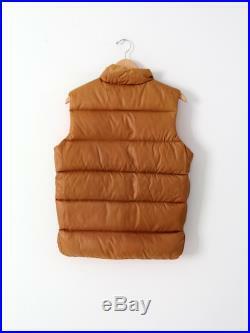 It is a nylon vest filled with down. 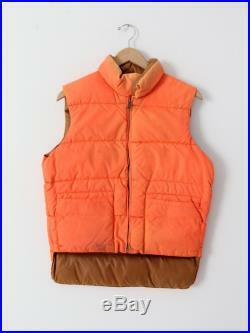 Spacecraft outerwear down filled nylon vest orange one side tan on the reverse pockets at waist snap closuresconditionin great condition. 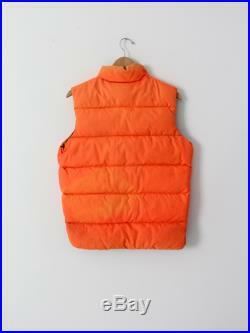 Marked size: smallmeasurementsbust: 21.5 (43). 54.6 cm (109.2)length: 25. 40.6 cmfront length: 19. 48.3 cmhow we measure vest measured lying flat bust measured from armpit to armpit across the front length measured down the center of the back front length measured down the center of the front shoulders measured between the shoulder seams across the back.